Musician Marc C. Miller had long thought Portland needed a song – a la “New York, New York,” “Chicago is My Kind of Town,” or “I Left My Heart in San Francisco” – but he couldn’t come up with a focus until he saw Portland’s new statue (at the time) – Portlandia. “I felt like writing about Portland through Portlandia’s eyes” (The Oregonian, 14-February-1987). From bridges, nightspots in neighborhoods, too. Together, we grow in love and respect for you. Holiday weekends, time to unwind. The lady of seasons belongs to us all. She fills me with pride. 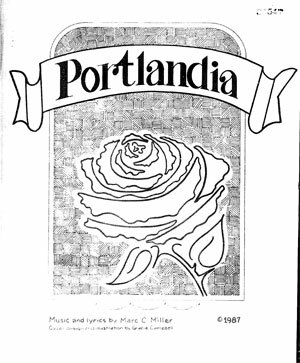 After a little lobbying and luck he got Mayor Bud Clark and the other members of the City Council to listen, and on May 3, 1989, with the adoption of resolution 34547, the song “Portlandia” was established as the official Portland City Song. Does anyone know where I might be able to hear the song? Or even some sheet music? ?